Bayonne, NJ – When wine writer Gabriel Geller heard about the man behind Covenant winery, he knew it was an inspiring story, one worth telling. 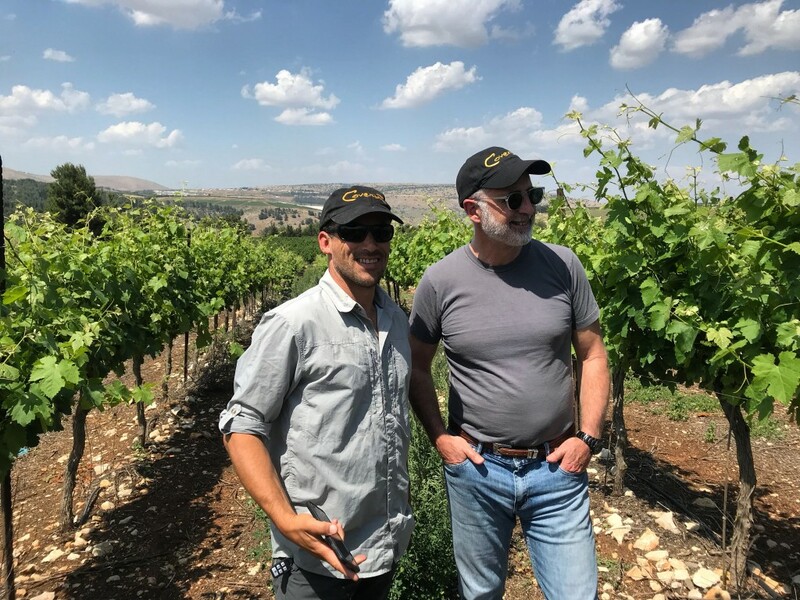 “It’s a story of faith, entrepreneurship, and chutzpah,” said Geller, who also serves as VP of Public Relations for Royal Wine Corp., distributor of Covenant wines in the U.S.
On the left it’s Ari Erle, the winemaker for Covenant Israel, Jeff Morgan is on the right. In 2002, Jeff Morgan was at a winemaking conference in Napa Valley, CA when an intriguing topic came up: why aren’t there more good kosher wines? The question led the journalist-turned-winemaker on a quest to produce not just a great kosher wine, but the best kosher wine in the world. It was a risk. As a long-time writer for Wine Spectator, Morgan knew that kosher wines had come a long way over the past few decades. But he had never made kosher wine before. In fact, his upbringing was so secular that his family had Christmas trees and he had never attended synagogue. Morgan teamed up with food and wine entrepreneur Leslie Rudd, a fellow non-observant Jew and owner of some of Napa’s most prized vineyards. They enlisted the help of Herzog Wine Cellars, secured OU certification, and the Covenant label was born. The first vintage was a Cabernet Sauvignon made from Napa grapes, released in 2003, that earned high praises from Wine Spectator and Wine Advocate. Two years later, Robert Parker declared Covenant “one of the finest kosher wines on Planet Earth.” And the raves kept coming. Covenant became a boutique brand with a cult-like following. Meanwhile, Morgan realized how little he knew about Judaism. So, he decided to reconnect with his Jewish roots – teaching himself Hebrew, reading Torah, laying tefillin – with his wife and business partner Jodie along for the spiritual ride. In 2007 he became a bar mitzvah. 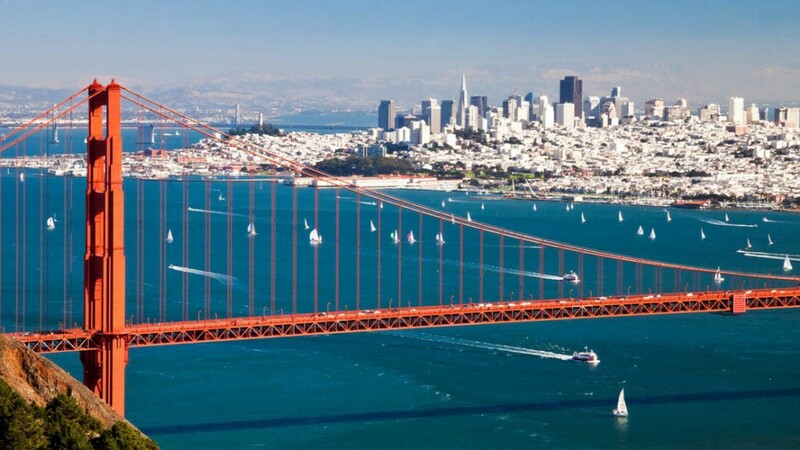 The couple became active in an Orthodox congregation in California. It was during a visit to Israel some 15 years ago when Morgan sampled an impressive Domaine du Castel Grand Vin, produced in the Judean Hills, and an epiphany: If he could make kosher wine in California, why not also make it in the homeland of the Jewish people, the place where Jewish winemaking began? That was when Covenant became the first-ever kosher wine to be produced both in the U.S. and Israel. The first bottle of Covenant Israel, a Syrah blend sourced from the Upper Galilee and Golan Heights, was released in 2015. And in 2018, Covenant ISRAEL Blue C Viognier and Adom became available in the United States. Today, Covenant’s portfolio includes 6 California wines and 3 Israeli wines available in the USA. In Geller’s view, “Jeff makes a wine in the Holy Land that’s as unique and superb as the wine he makes in California. Covenant Israel was the talk of the Kosher Food & Wine Experience NYC!” The label’s Syrahs, Blue C Viogniers, and Blue C Adom red blend are made in limited batches and consistently earn rave reviews. On a poignant note, the Morgan’s friend, mentor, and Covenant co-founder Leslie Rudd passed away in May. But Covenant is very much a family affair. Jeff and Jodie’s daughter Zoe made Aliyah four years ago and heads up hospitality, sales, marketing, and more in Israel. And Covenant Israel is rapidly becoming one of the most highly regarded brands not just in Israel but in the world. Napa, California – Robert Parker Wine Advocate and RobertParker.com, the world’s most widely read independent consumers’ guide to fine wine, announces the appointment of William Kelley, who will join the reviewer team on January 1, covering the regions of Burgundy, Chablis, Beaujolais, California Central Coast and Washington State. Robert Parker’s Wine Advocate Castiglione Falletto, as photographed by our own Monica Larner. Robert Parker Wine Advocate is currently the most comprehensive wine review publication in the world, with more than 350,000 tasting notes in its database, housed by their seminal wine reviews website, RobertParker.com. 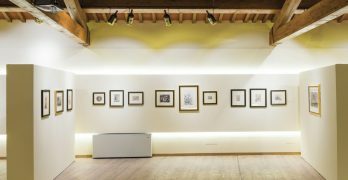 “We are in discussions now with hand-selected wine experts from across the globe to add to our current team of nine reviewers next year, expanding upon what is already the largest team of full-time reviewers of any of the major wine criticism publications,” said Perrotti-Brown. Currently producing over 30,000 reviews per year, Robert Parker’s reviewer team aims to produce more than 50,000 reviews per year by 2020. News about the other new reviewers to join the Robert Parker Wine Advocate team will be released in early 2018. 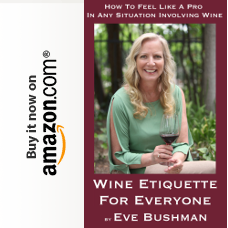 While remaining the foremost “Independent Consumer’s Guide to Fine Wine” is the core of Robert Parker Wine Advocate, the publication and team of experts will also look to step up wine consumer engagement by staging more wine events in the year to come. Highlights in the first quarter of 2018 will include iconic Burgundy dinners in Hong Kong and Rio di Janeiro, featuring rare gems such as Domaines Coche-Dury, Dujac, Raveneau and Ramonet, and another blockbuster two-day event in Zurich. Full details will soon be available on the Matter of Taste website, www.a-matter-of-taste.com. Thanks to the effort of Paso Robles CAB Collective and its members, Paso Robles’ Bordeaux wines are earning more accolades and fans than ever before. The secret is out: Paso Robles is producing some of the best wine on the planet. 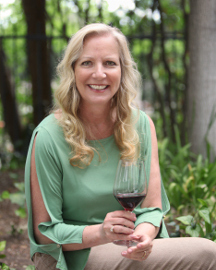 Paso Robles, Calif. – The Paso Robles CAB Collective, (pasoroblescab.com), is proud to share that Paso Robles continues to be recognized as one of the world’s premier regions for Cabernet Sauvignon and red Bordeaux varietals. In the latest issue of Robert Parker’s Wine Advocate, Paso Robles CAB Collective (PRCC) members were awarded dozens of scores well above 90 points for their red Bordeaux-style wines including 98 points and 96 points for DAOU Vineyards & Winery’s 2013 Patrimony and 2013 Soul of a Lion, respectively; 92 points for Adelaida Vineyards & Winery’s 2013 Cabernet Sauvignon Signature Viking Vineyard; Ancient Peaks Winery’s 2013 Oyster Ridge Margarita Ranch; 93 points for The Farm Winery’s 2012 Cabernet Sauvignon Cardinal; and 91 points for J. Lohr Vineyards & Wines’ Cabernet Franc-based 2013 Cuvée St. E, among many more. DAOU’s 98 points is officially the highest score Paso Robles has ever received, and represents the ongoing vision and hard work of the Paso Robles CAB Collective and its members. Formed in 2012, the PRCC was the brainchild of Winemaker & Proprietor, Daniel Daou, DAOU Vineyards & Winery, who along with J. Lohr Vineyards & Wines, JUSTIN Vineyards & Winery, Adelaida Vineyards & Winery, Eberle Winery, Vina Robles Vineyards & Winery and Chateau Margene formed the Paso Robles CAB Collective to actively promote its members and foster knowledge sharing and best practices beyond fence-line chats to ensure producers could craft world-class red Bordeaux-style wine. The Paso CAB Collective now includes twenty two producers – and the list is growing. Most recently, PRCC member San Antonio Winery was just nominated as the 2016 American Winery of the Year by Wine Enthusiast magazine. 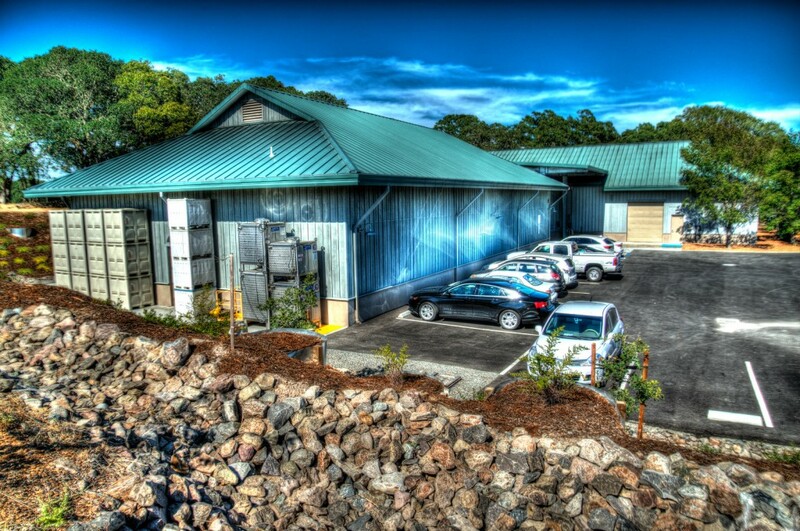 Last year, Wine Enthusiast magazine awarded American Winery of the Year to PRCC member JUSTIN Vineyards & Winery. Beyond the glowing praise among critics and sommeliers, Paso Robles’ producers are planting more Cabernet Sauvignon than ever before, ensuring the area continues to position itself alongside the world’s top regions. More than 55 percent of Paso Robles’ 41,000 acres of vineyards are made up of Cabernet Sauvignon and other red Bordeaux varietals. In 2015 and 2016, roughly 3,000 new acres of vineyards were planted in Paso Robles, of those, an estimated 50 percent were Cabernet Sauvignon. “Bordeaux varieties are the future of Paso Robles,” says San Antonio Winery Winemaker Ben Mayo, who recently joined San Antonio to help grow the winery’s investment and reach of its high-quality Cabernet Sauvignon program. 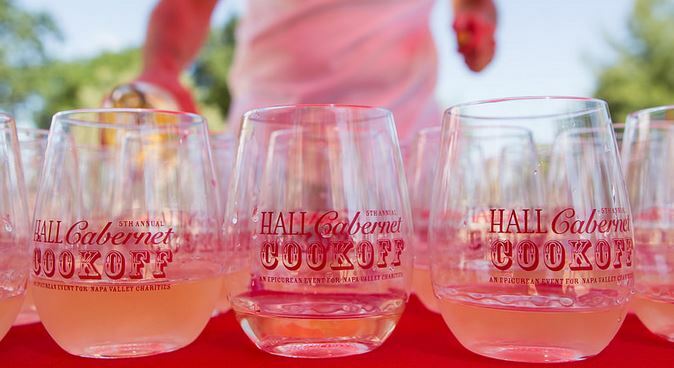 Taste these critically acclaimed Cabernet Sauvignon and red Bordeaux varietals, featuring over 75 wines from the 22 members of the Paso Robles CAB Collective as you come face-to-face with winemakers at the picturesque Allegretto Vineyard Resort in Paso Robles on Friday, October 14th from 4 to 6 PM. 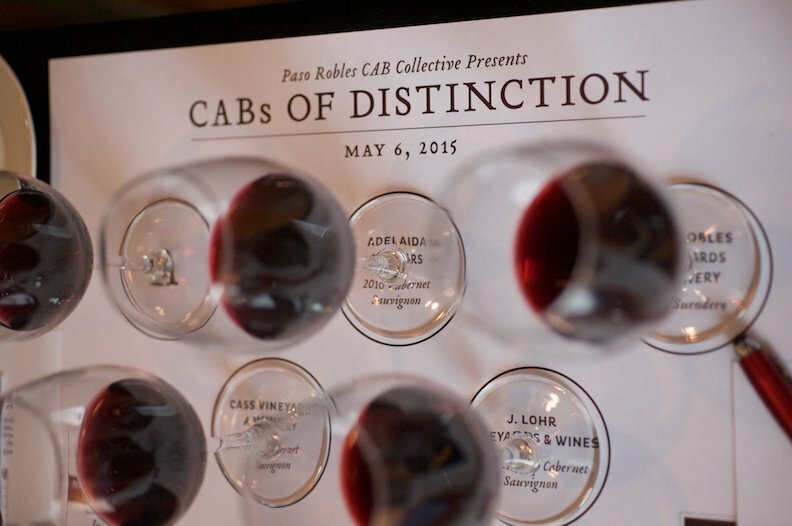 Tickets may be reserved now at www.pasoroblescab.com/events/cabs-of-distinction-grand-tasting. Enjoy live music by renowned vocalist Nicole Stromsoe with guitarist Dorian Michael while you delight in small bites prepared by Executive Chef Eric Olson of Cello Ristorante & Bar. 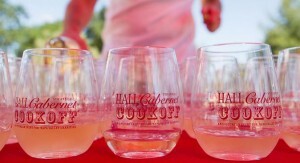 This event is the ultimate way to start your Paso Robles Wine Country Harvest Wine Weekend. Passes for qualified media may be obtained by contacting Linda@ParkerSanpei.com. Members of the Paso Robles CAB Collective include: Adelaida Vineyards & Winery, Ancient Peaks Winery, Bon Niche Cellars, Brecon Estate, Calcareous Vineyard, Cass Vineyard & Winery, Chateau Margene, Clos Solène, DAOU Vineyards & Winery, Eberle Winery, Halter Ranch Vineyard, J. Lohr Vineyard & Wines, JUSTIN Vineyards & Winery, Opolo Vineyards, Parrish Family Vineyard, Pomar Junction Vineyard & Winery, RN Estate Vineyard & Winery, Rotta Winery, San Antonio Winery, Sextant Wines, The Farm Winery, and Vina Robles Vineyards & Winery. 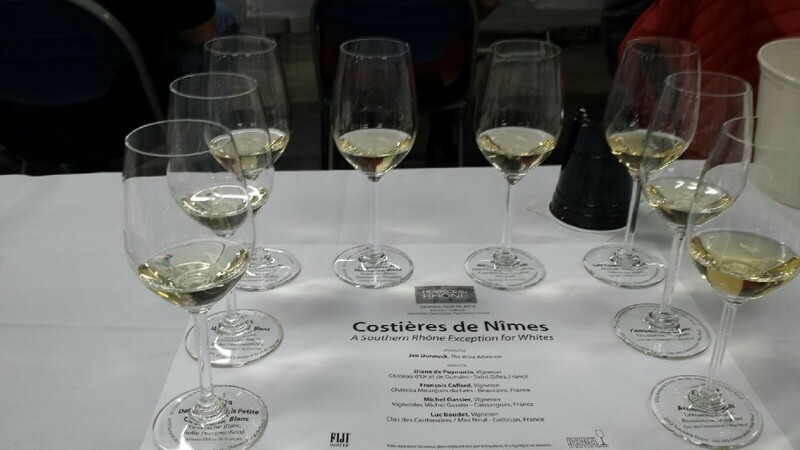 The next day started bright and early with the first seminar on white wines at 9:30 AM. [White wine – it’s what’s for breakfast, right?] John Alban complimented us all on making it to the seminar given what must have been a late wine-filled evening for everyone. I apologize if I have misspelled any of the names of the winemakers, wineries or wines. Admittedly, I need to work on my French wine knowledge. Also, please excuse the lack of diacritical marks in this entire series of articles. I was unfamiliar with the Rolle grape – turns out it is what the Italians call Vermentino. We loved the fruit, freshness and vibrancy of these wines. 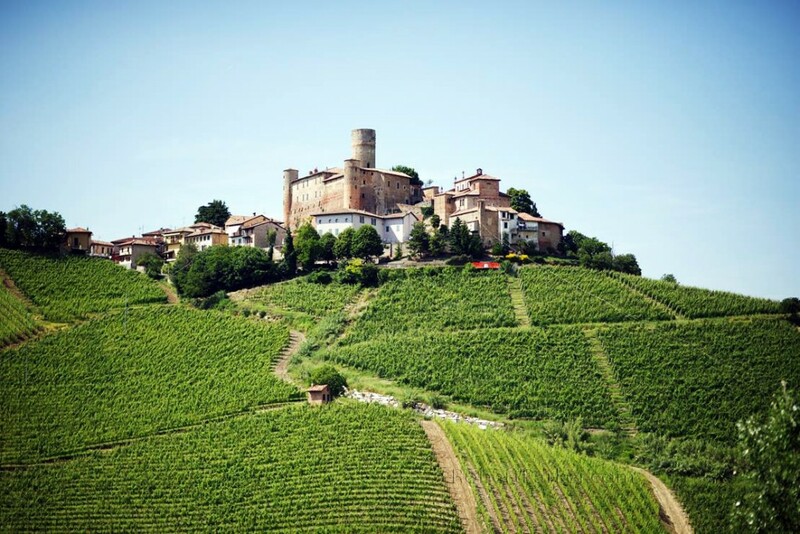 This region of the Southern Rhone is devoted primarily to red wine, so this gave us a unique opportunity to taste fairly rare wines from a region that has been producing wine for about 2,500 years. 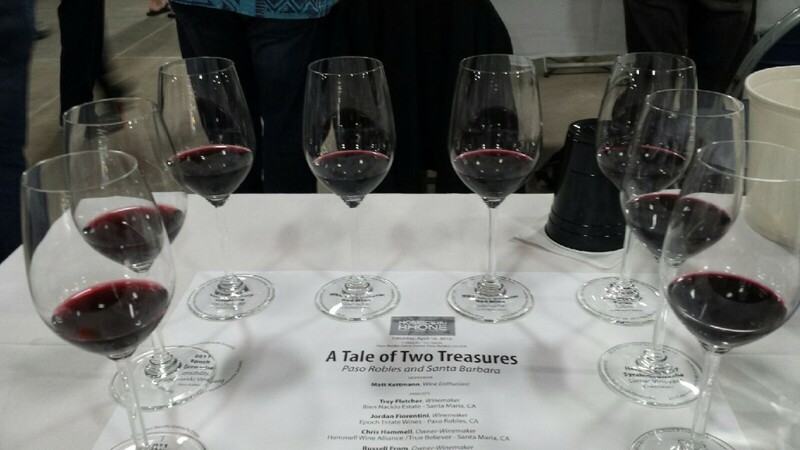 The second seminar was right up my alley [and everyone else’s] – comparative tastings of Syrah and Grenache from the Central Coast, called A Tale of Two Treasures: Paso Robles and Santa Barbara. In this seminar, moderated by Matt Kettmann of Wine Enthusiast, two wines each were presented by Jordan Fiorentini of Epoch Estate Wines, Russell From of Herman Story Wines, Trey Fletcher of Bien Nacido Estate and Chris Hammell of True Believer from Hammell Wine Alliance. Yes, this was the same Chris Hammell that we had the chance meeting with the previous evening and he was as entertaining during the seminar as he was at dinner, along with all the other participants, which just helped to support the theory that the Rhone winemakers are the coolest of all the winemakers. Although I am not much of a blind taster, in this case I wish we could have tasted these wines blind. It would have been fun to try to determine which were which. I’m pretty sure I could have picked out Jordan’s wines, since I am most familiar with hers. Regardless, this was red Rhone heaven. It was getting closer to the Closing Tasting, but first it was time for lunch, prepared by Chef Brian Collins and his team from Ember restaurant, along with lots of Rhone wines to pair with the food. There was also a live auction. The day was already a success and now it was time for the Closing Tasting! From Petaluma we headed toward the town of Sonoma itself. With so much happening in the square itself, it is often hard to find affordable accommodations in heart of it all. But a great alternative is practically walking distance from the town square. The El Pueblo Inn offers great modern rooms just a mile or so from downtown Sonoma. Don’t let its modest exterior dissuade you. With the comfortable rooms and beautiful garden this is a terrific choice at an affordable price and puts you very close to all the action. But our own action was going to take us farther afield than the town square, so after a restful night, Karen and I left El Pueblo Inn and headed east toward Santa Rosa and then north to Windsor, where we were scheduled to connect with our old friend Mike Officer of Carlisle Winery. Recently, I was talking about Carlisle with a friend of mine, who is a lover of all things Napa. I explained how Mike had left the software development industry to follow his passion of making wine. My friend equated the story to one of his favorite small Napa winemakers who made a boatload of money in tech, retired and dropped a fortune on some premium property to grow grapes and make $150 per bottle Napa Cabs. Well, no, it wasn’t like that at all. Mike developed a passion for wine at a young age and, after discovering that software development was not his passion, started making small batches of Zinfandel with his wife Kendall Carlisle and some friends. Accolades came, production grew, and eventually they went commercial [on a shoestring budget] in 1998. 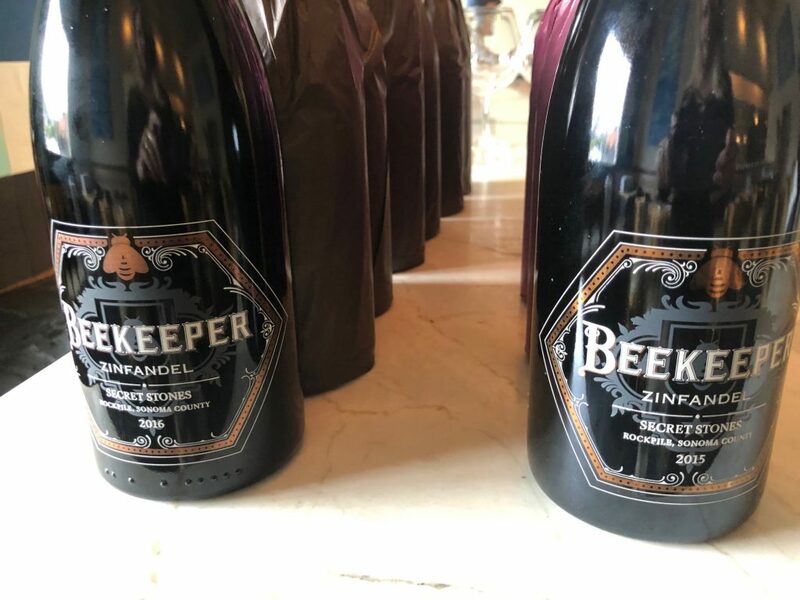 Since then Mike and Kendall Officer have been on the forefront of the efforts to save and promote the older and sometimes ignored vineyards in California, focusing primarily on Zinfandel, Syrah and some great field blends. They are truly two of my heroes in the Heritage Vineyard movement. Eventually, Mike quit his day job and committed full time to the winemaking operation. For several years, Mike and Kendall made wine at custom crush facilities. But, production eventually reached critical mass and when a winery facility became available in Windsor, they made the next logical move. 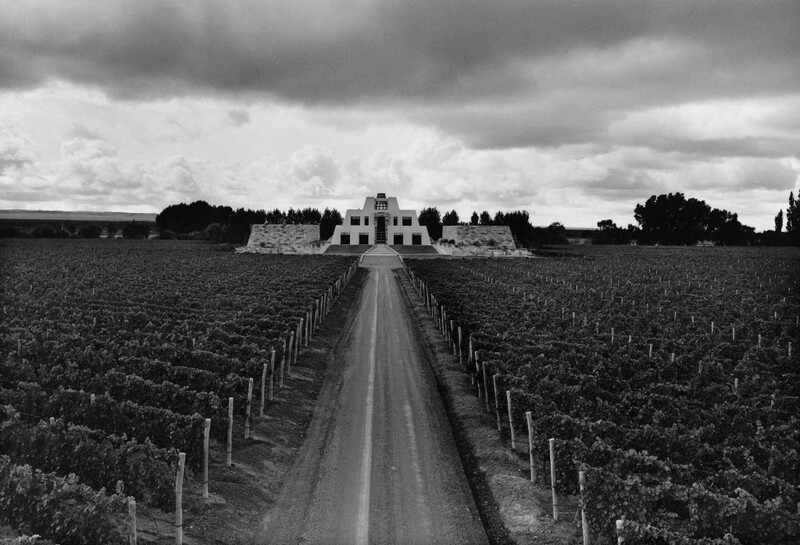 Acquiring the winery in Windsor in mid-2013, a lot of work was needed in order to bring it to their specifications to be ready for harvest 2014. And, wouldn’t you know it? Much like 2015, 2014 harvest was early, but they were ready for the first fruit in August of 2014. There is no tasting room at Carlisle and visits are by appointment only, typically for existing customers who want to taste what’s in barrel for the next releases. And that’s what we did, tasting through a delicious array of barrel samples of the 2014 vintage of Zinfandels [including the Saitone, Carlisle, Papera and Montafi vineyards], Syrahs [Papa’s Block and Rosella] as well as the Palisades Vineyard Petite Sirah and Two Acres Vineyard field blend, among others. I can’t wait to get the next release email. Of course, I wasn’t the only one to discover Carlisle early. Robert Parker’s scores in the Wine Advocate were immediately stellar, as were other ratings, and demand forced Mike to quickly create an allocation system. The mailing list soon became full and the length of the waiting list became somewhat legendary. Yet, Mike has always kept his pricing reasonable. The good news is that, as Mike has continued to discover exciting old vineyards and slowly increase production in the new facility, there is actually some room on the Carlisle mailing list, at least as of our visit. But, don’t wait too long. Production of the 2014 vintage will be around 10,000 cases, 2015 will be a little less due to the smaller harvest. And who knows what the future will bring?